To correct severe deformities which are disfiguring and may have functional consequences to vision, breathing, and mastication, craniofacial surgeons may find it necessary to perform skeletal osteotomies (surgical freeing of the bones with chisels and saws) and rearrangement. These operations are significant undertakings. Many more patients have mild forms of these deformities (eg. "prominent eyes" due to underdeveloped bones beneath the eyelids or "receding chins" due to underdeveloped jaws). Particularly in the lower face, some patients have had partial correction of chin deformities through orthodontic treatment. In these patients with less severe abnormalities or those who already have had orthodontic treatment, the appearance of skeletal osteotomies and rearrangement can be simulated through the use of facial implants. 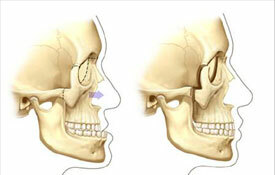 Diagrammatic representations of how implant surgery can mimic the more extensive skeletal osteotomies are shown below. 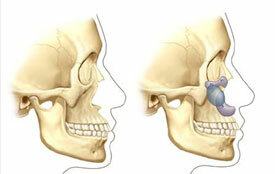 The LeFort III osteotomy and advancement is used by craniofacial surgeons for patients whose eyes are extremely prominent and whose upper teeth do not meet their lower teeth because the bones between the eyes and the lower jaw are underdeveloped. The combination of infraorbital rim, paranasal, and malar implants may simulate the appearance obtained with the LeFort III advancement. 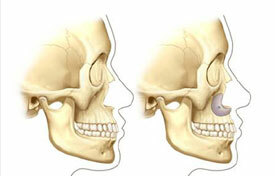 If the eyes are not overly prominent and the occlusion (tooth fit) is acceptable. 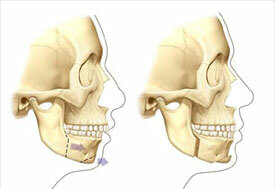 The LeFort I osteotomy and advancement is often performed in patients whose upper jaw is under developed - giving their face a concave appearance. In patients who have midface concavity and normal or corrected oclusion, paranasal implants can fill out the lower midface to create a convex appearance. Sagittal split osteoteomies and sliding genoplasties are used to bring the lower jaw forward. 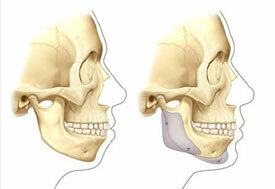 Mandibular angle and chin implants can often provide the same external appearance as the more extensive osteotomy procedures. Clinical examples of patients who have had these procedures are presented in the patient examples section of this web site.